I’ve been putting some of the Sugoi women’s cycling clothing through it’s paces this summer and the women’s RSE jersey and shorts have turned out to be one of my favourite road cycling outfits. Constructed from REVO fabric, the white short-sleeved jersey feels silky to the touch and pleasantly cool in hot weather or high intensity situations. The blend of nylon and spandex is very stretchy, comfortable and breathable thanks to a micro-filament linear knit which wicks moisture away from the skin. 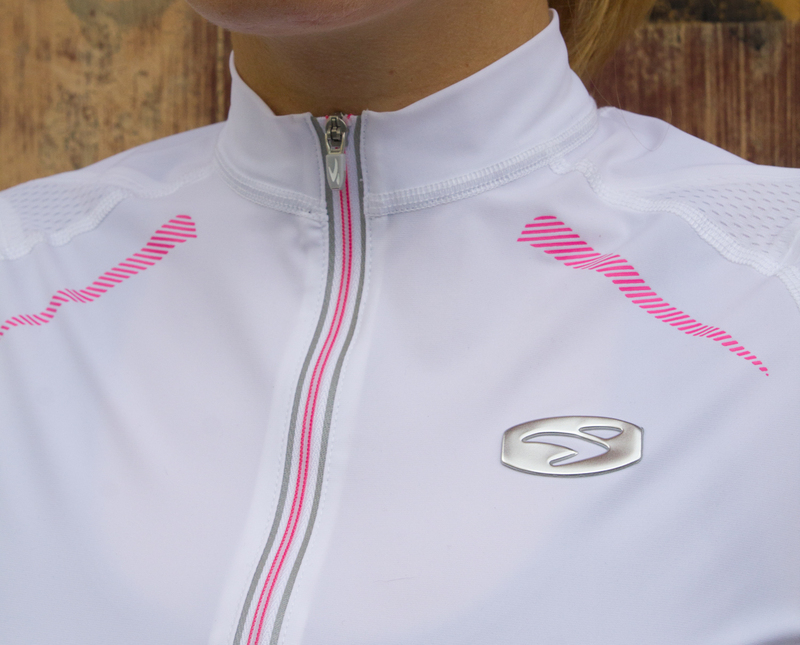 A mesh back and deep mesh panels under the arms provide increased airflow. 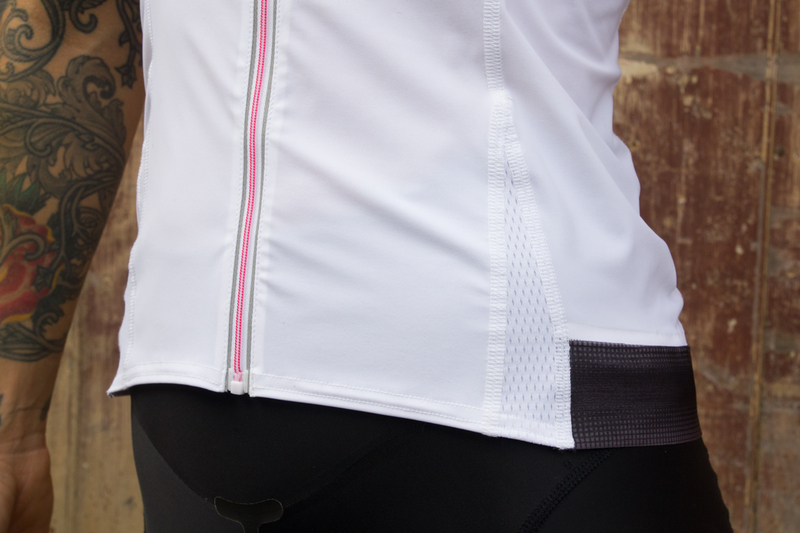 The cut is good – I found the slim, race fit and ergonomic panels very flattering and the overall look is pretty snazzy – I felt really smart in this kit! I like dressing up to go riding; I definitely pay more attention to what I’m wearing riding than what I’m wearing on a night out. I’m 5ft7ish and a size 8-10 with fairly wide shoulders and a small waist, kind of like an inverted triangle. I found the size small fitted well at the top but there was a little bit of sag around my waist. People smaller than myself might be out of luck as the jersey doesn’t come in Extra Small. Though I normally hate pink, the white and pink full length front zip and back pocket closure look really nice and the 3M reflective detailing on the front is functional and attractive. 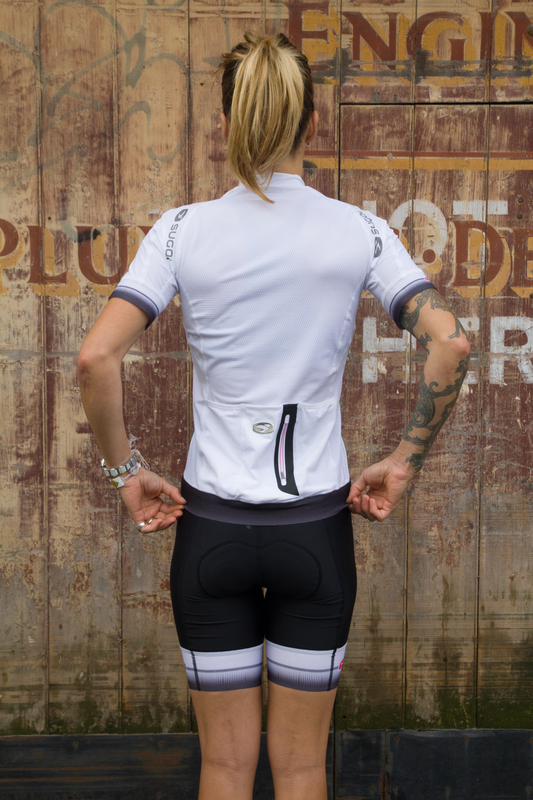 Reflective logos along the back of the shoulders add greater visibility in gloomy conditions. One of my favourite parts of the jersey is the wide, unstitched cuffs, which like the rest of the top look and feel good and function well. The friction free band around the sleeves gently grips to keep your sleeves in place without cutting into your arms. They look smart and feel even better. Soft seams throughout the rest of the garment further add to your comfort. Sugoi means ‘incredible’ in Japanese, and in the case of the RSE kit, I’d have to say it’s a fitting moniker.